William J. Harris, Tyrone Williams, and Aldon Nielsen join Al Filreis to talk about a poem by Lorenzo Thomas. 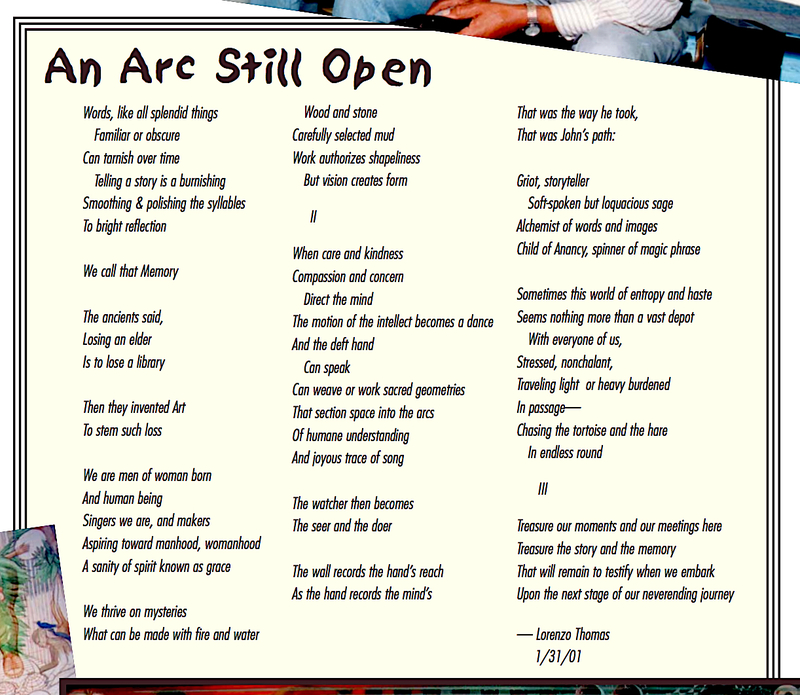 The poem is “An Arc Still Open,” written as a commemoration of the muralist John Biggers, who had died in January 2001. 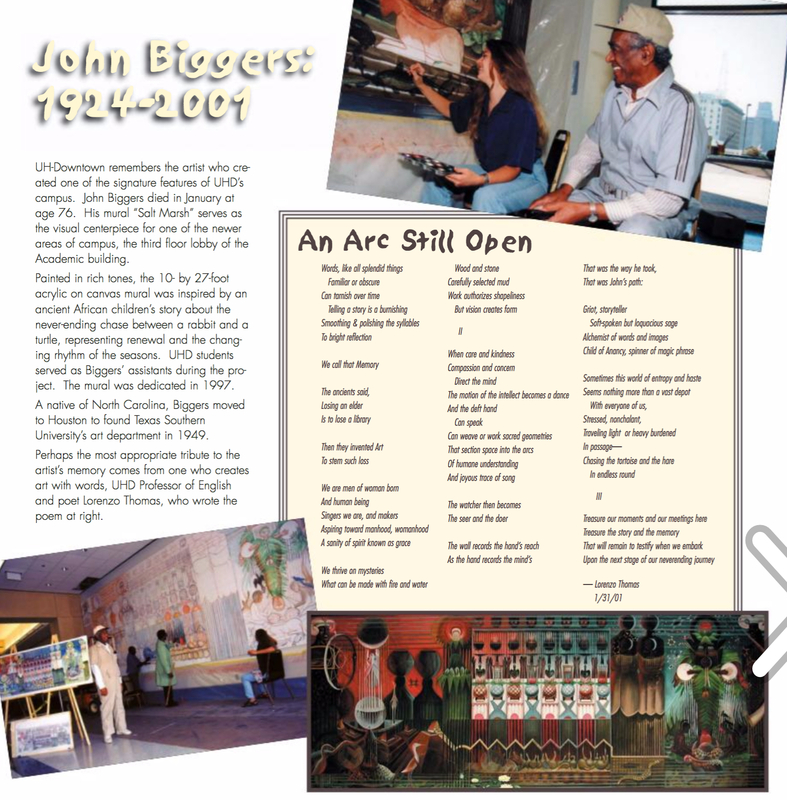 The poem was written on that last day of that month, and was published, soon after, as part of a John Biggers memorial feature in a magazine produced on the campus of the University of Houston-Downtown, where since 1997 there had hung a huge (10' x 27') Biggers mural called Salt Marsh. Lorenzo Thomas was himself a beloved professor at UHD for many years. Our text of the poem comes from the (rare) UHD publication, New Horizons, and our recording, now found on PennSound’s Lorenzo Thomas page, was made at the University of California at San Diego, where Thomas went to give a reading in May of 2001. See below for reproductions of text and related matter. The PoemTalkers spend some time pondering the importance of — and the relevance of the poem to — what Tyrone calls “the move [Lorenzo] made to Houston, his choice to work with the community there” and its presumed consequent lessening of what might have been a more visible or limelight-proximate, and more remunerative, national poetic career. The choice he made of place and community puts the group in mind of this phrasing in the poem: “The watcher then becomes / The seer and the doer.” It seems to refer to Thomas and Biggers both — their art of “the hand’s reach” and also their environmental, communitarian sense of the socio-aesthetic power of people’s humane response to seeing art, which leads to doing. Of course, another way in which Lorenzo Thomas in this poem is writing about Biggers and yet also the two artists together is implied in the quality of this poem as a kind of pre-elegy. It’s a “late style” for Thomas, and Aldon finds that aspect especially important and moving. For one thing, now that the text of this occasional poem has been found, it can help represent the arc (there’s another sense of “arc”) bending toward the end of the lifework — in the prospective Collected Poems. 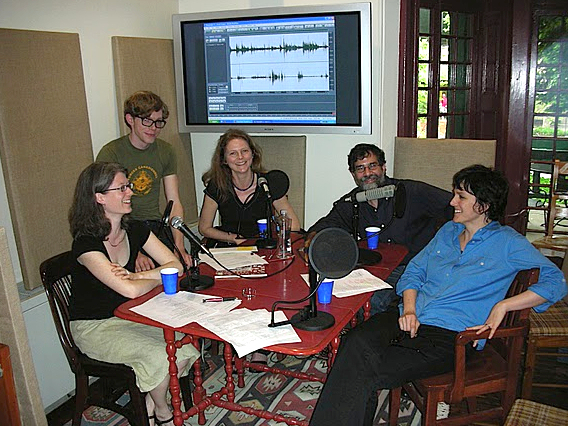 This episode of PoemTalk was recorded in the Wexler Studio of the Kelly Writers House — directed and engineered by Zach Carduner, and later edited by the very same Zach Carduner. PoemTalk is made possible by a generous grant provided by Nathan and Elizabeth Leight, to whom we are enormously grateful, and is a coproduction of the Kelly Writers House, PennSound, and the Poetry Foundation. 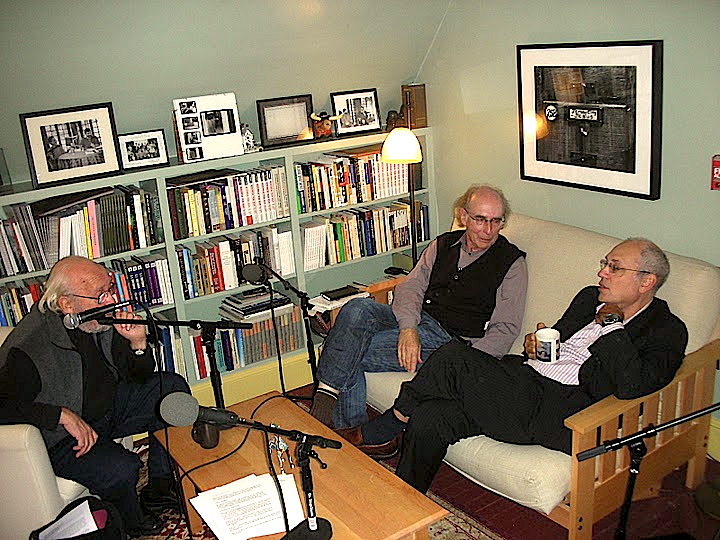 Next time on PoemTalk Stephen Ross, Rachel Blau DuPlessis, and Ariel Resnikoff join Al to talk about some translinguistic poems from Uxudo by Ann Tardos. Click on either image below for a larger view.